Acitores Organería y Arte, S.L. 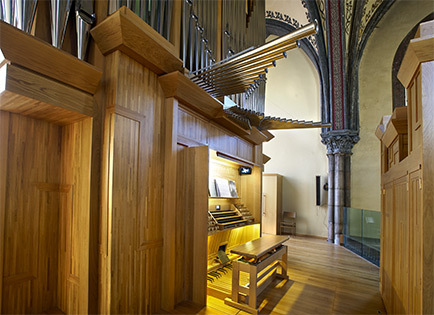 Acitores Organbuilding and Arts Company, S. L. is a profesional team, led by the master organbuilder and organist Federico Acitores, dedicated to the manufacture and restoration of pipe organs. The Company with an experience of more than 35 years, is based in Torquemada (Palencia) Spain with a 1500 m2 area, with facilities especially made for the building / constructions of the organ, where he has done extensive work in Spain and other countries such as Portugal, Germany and Philippines. Acitores also offers services of restoration, either directly or in collaboration with other companies depending on the task to be performed. Acitores is professional, dedicated and well experience.